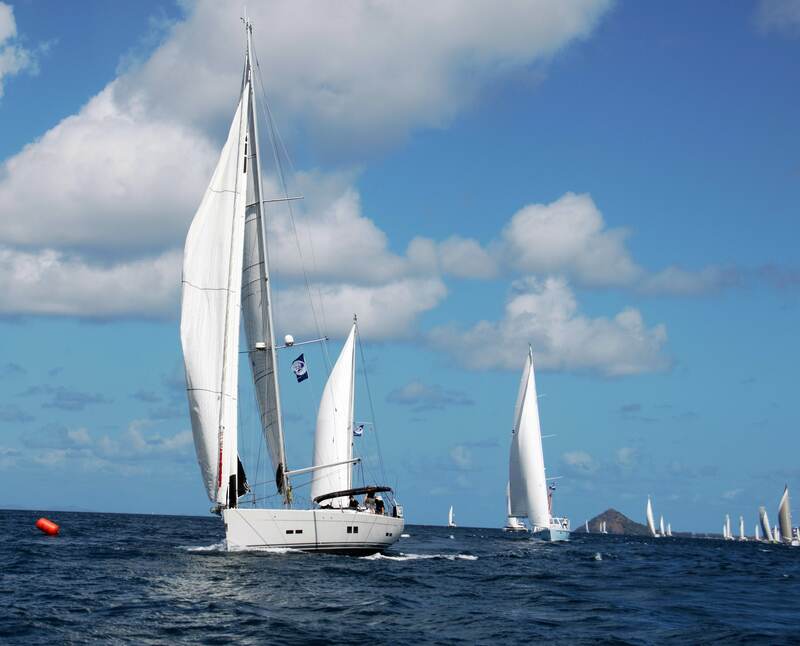 Today the World ARC 2019-20 fleet set off from Saint Lucia at 12 noon beginning their adventure of a lifetime following years of dreaming, thinking, planning and preparations. 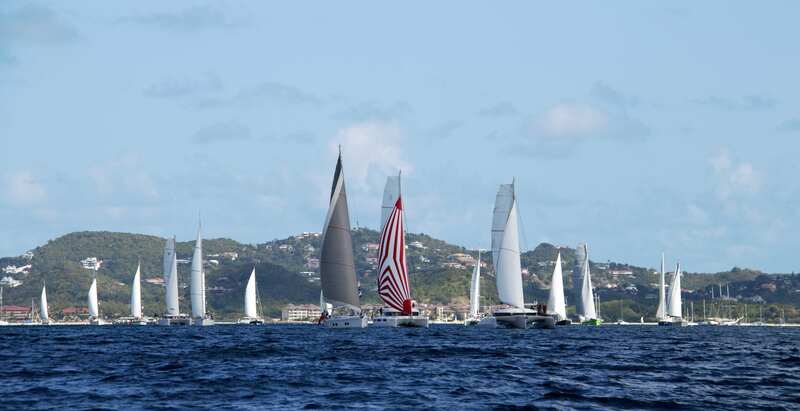 Departing were a fleet of 26 yachts from 12 different nations and their gathering out in Rodney Bay made a great spectacle as the first leg of the 9th edition of World ARC got underway. On the docks before departure, crews wished one another well for the voyage and said their final farewells to the friendly staff of the businesses around IGY Rodney Bay Marina who have helped prepare them for today’s start. Weather conditions on the start line were very favourable for the fleet and indeed described as ‘near perfect’ by meteorologist Chris Tibbs. Sunny skies and steady 10-15 knots easterly breeze blowing off the land created patches of stronger and lighter winds in the bay as the yachts prepared for the start. Although World ARC is a rally not a race, friendly competition was already evident as leading the way across the start line was the German-flagged Hanse 575 Seaside closely followed by Jopie Helsens’ colourful cruiser Sky and Australian catamaran Resolute II. The rest of the fleet followed in close succession leaving Rodney Bay keeping the Barrel 'O' Beef to starboard and then making their way along the coast down to Castries. On reaching the mark, the fleet gybed away from the Caribbean island which has hosted the start of their adventure raising their downwind sails to make the most of the glorious trade winds. Also, out on the water was the VIP vessel, Shadow, kindly provided and skippered by Robin Hobson, with local spectators. A special thanks also goes to the Marine Police who provided both the start line boat and the vessel for members of the local press. The start today marks the end of a fantastic programme for the World ARC crews in Saint Lucia. The programme would not be possible without the support of several local organisations. World Cruising Club and the World ARC participants would like to thank the Saint Lucia Tourism Authority, IGY Rodney Bay Marina and the Saint Lucia Yacht Club for all their generous assistance. “The crews have had a busy and enjoyable programme in Saint Lucia whilst getting ready for the start of this amazing adventure." said World Cruising Club Managing Director Andrew Bishop. "They represent different nationalities, ages, motivations, and crew dynamics, and so in between the serious preparations such as safety checks, seminars and briefings, this week has been about getting to know new cruising friends, who'll be together for the many months ahead. The start from Rodney Bay was a spectacular end to that programme and beginning to their sailing adventure with World ARC." Next stop for the fleet will be Santa Marta Marina on the Caribbean coast of Colombia. The stopover is one of the most popular on the World ARC route, with plenty of good food, exceptional beaches and warm hospitality awaiting their arrival. They can expect good trade wind conditions along the way with occasional and isolated squalls typical of ocean sailing. The boats should start to make landfall from Thursday 17 January.